Monocrystalline photovoltaic electric solar energy panels are the most efficient way to produce energy from the sun. Every module in the panel is made of single silicon crystal. This increases their efficiency, and thus they are more expensive than the other versions such as polycrystalline and thin-film available. These panels are generally black or iridescent blue in colour, which makes them distinct from the other types ofpanels. Here we review Renogy 200w Solar Starter Kit which is available in the market. The Renogy 200w Solar Starter Kit consists of Two Renogy Premium Grade a High Efficiency 100 Watt Monocrystalline Solar Panels. Renogy’s new 30A PWM negative ground charge controller has been introduced in this version. This is also popularly called Renogy wanderer. This can help expand your solar panel system up to 40 W maximum. Thus, you can cater to expanded need at a later date as required. The output is at 1000Wh per day, which can help RVs, trailers, boats, cabins, jet skis etc.,. The 50Ah battery which is a part of the solar starter kit can be fully charged within 1.5 hours. This however, depends on the sunlight available in the area and the consistency of the sunlight. There is an 8 ft 10A WG Tray cable which can be used to connect the charge controller and battery. Many users have found this length a bit short, the solar panels may be kept on the roof top. The battery may be kept in a concealed place to avoid humidity or rain falling over it. The length of the tray cable could be short in such a perspective. The product dimension is 47 x 21 x 3 inches, it weighs around 47 pounds overall. At this weight it is quite mobile and can be handled quite conveniently. The set up may require help and professional assistance, the panel has to be positioned such that there is appropriate amount of sunlight falling on it at all point of time. It should not be positioned in a place where there is likely to be any shadow of building, trees etc. There are Bypass diodes which minimise the power drop that can be caused by the shade. This ensures excellent performance even in environments with minimal lighting. The Renogy 200w solar starter kit can be beneficial in many aspects. It offers quiet power production and grid independence. If you were to mount an off-grid system of small size, it can give you immense independence in terms of mobility. Most of the smaller electronic systems can be easily charged without the assistance of a generator. This methodology also does not need any electrical outlet which can again be immensely cumbersome. The system is designed for high solar cell effectiveness – the panel is a combination of 18.4% Monocrystalline and 17.9% Polycrystalline. The panel is EL tested solar modules, there is no hot-stop heating ability built into it. Since these panels are typically placed outdoors, they are built with Corrosion-resistant aluminium frames. This particularly allows the panels to last longer. The unique TPT black sheet is highly effective in capturing solar energy and converting it to usable electrical energy. They ensure that the performance is smooth over a long haul. These TPT sheets are expensive but they are well worth the investment, especially if you intend to use Solar system quite extensively. There is a junction box, which is rated at IP65; this offers protection against dust and other environmental / chemical particles. It is also built to resist low pressure water jets which may be used to clean the panels and the entire unit. This feature also makes it easy to maintain in the long run. As stated earlier, it is an easy set up; it may require a hand with some knowledge of the workings of a solar panel kit. You can use the assistance of DIY solar projects which are available in abundance on the internet. There are many DIY solar panel installation videos which can provide the required assistance in case you are installing solar panels yourself. The entire process of installation and connecting with the battery may be simple. However, you need to also connect it with the electronic equipment which will inturn use the energy source from the battery to run its unit. There are many individuals who make homemade solar panels; these may not be as efficient as the one that you buy in the market since they lack the professional touch. It may cost you much lesser and can be used for smaller projects such as lighting up a part of the house or for heating water etc,. There are numerous DIY solar panels for home use which can provide you some insight on how to make homemade solar panels and how to use them for lighting up your home. This can be an alternate means of energy source for your home. This can be a very economical way to fund your electricity in your home. The main issue with solar panels is that it may not charge during winter season. This is the main drawback. Many regions are not blessed with as much sunlight; it becomes highly unviable to use solar energy in such places. Renogy 200w Solar Starter Kit will particularly be enough if you have minimal requirement in terms of power. It can be handy for using LED light, laptop, fan, occasionally use the fridge, TV. However, it may not be enough if you want to use the oven or run the fridge, TV for longer. In such cases you will have to upgrade it to 400w. It is not a foldable panel; hence travelling with this panel can be very tricky. Many other solar panels are designed in the form of a suitcase; this may suit best for travellers. Although the panels are not heavy and handling them is quite simple, it may not be suitable if you do not install it permanently. They may occupy sizeable space for storage. Renogy 200w Solar Starter Kit is a popular name amongst solar power users. 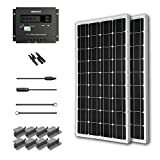 The Renogy 200 Watt 12 Volt Monocrystalline Solar Starter Kit is best suited for households, trailers, boats etc. Many households use this in place of an inverter, thus using the solar energy at a time when the conventional energy is unavailable. Using solar energy is the best way forward; it helps us reduce the carbon footprint that we leave behind. It uses the natural resource, sunlight in the most effective way. Renogy 200w Solar Starter Kit is reasonably priced and provides the entire requirement as part of the kit. There is no need to hunt for separate items; this makes it a lot easier. The installation is quite easy. You can use the assistance of numerous videos on DIY solar projects, DIY solar panel installation which can be of immense help.